Hi all, just wanted to talk about the new poll for a second. The new poll is all about the incoming freshmen class of The First School. Obviously there a plenty of other talented rookies to include in the poll, however I capped it at 15 which is probably too many already. I didn't want it to take over the whole page. I used Real GM's Mock draft to pick the first 15 names to be included. I also set it up so that you can vote for any or all of the players listed. I also set the poll to end the night after the draft and we'll see if these are the first 15 names called. Also I thought I'd give you all some Sole Candy today with these neon Converse straps. 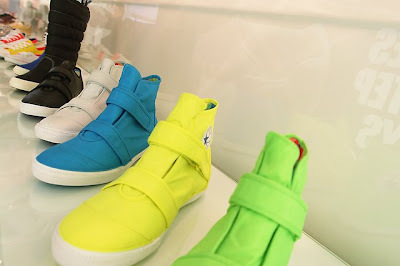 These pics are from the Bread & Butter trade show. This actually picture comes from Label Networks. Let me just say, these are insane and I hope we actually get to see them here. Well that's it for today, I can't wait to see how the poll turns out. Thanks for stopping in and voting, see you tomorrow. tell me where to get it! I hope sometime in the near future.